READ 30 - King&#039;s Gold FREE online full book. 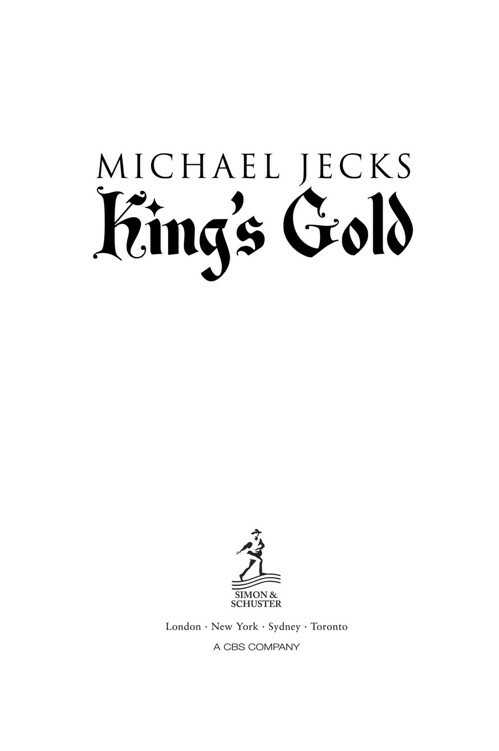 Michael Jecks gave up a career in the computer industry to concentrate on writing and the study of medieval history. A regular speaker at library and literary events, he is a past Chairman of the Crime Writers’ Association. He lives with his wife, children and dogs on northern Dartmoor. 78 of the Copyright, Designs and Patents Act, 1988.
to actual people living or dead, events or locales is entirely coincidental. with thanks for Fnob Cheese! felons who claimed sanctuary in a church were sometimes offered the chance to abjure the realm i.e. accepting voluntary exile in preference to being executed. They must confess to their crime, after which their property was all forfeit, even if subsequently they were pardoned or shown to be innocent. a ferocious hunting dog, built like a greyhound but much larger. the bread of poorer folk, used especially for making trenchers, was made from flour which was not so carefully sieved and prepared as white flour. underclothes consisting of linen or loose woollen material that was full in the bottom and reached sometimes to the calves. The waist was often curled over and over to form a sort of belt, sometimes with strings to tie it up. a channel running along the length of a sword blade, sometimes called a ‘blood gutter’, it was intended to reduce the weight of the blade without weakening it. a staff held with hands apart over the middle so that roughly half the staff was between the hands. As a weapon, it could be used to jab with either end, or to block another fighter’s weapon with the mass of the centre. , a French term that would not come into common use in English until the Hundred Years War. central gulley or gutter in a medieval street. a primitive, eel-like fish that was prized as a delicacy in medieval times. Henry I was said to have died from ‘a surfeit of lampreys’. mixture of rye and wheat, used for breadmaking. special, creamy white bread made with the highest grade of flour, from which much of the bran (but not wheatgerm) had been removed by sieving through cloth. torture in England was illegal before the 1300s, but if an accused man refused to plead, he could be forced to lie on the floor, shackled to rings, and to have weights set upon his chest until he complied. Many died, unable to breathe (another ‘natural’ death for a prisoner). drink made from fermenting pears – similar to cider, but sweeter.
) the manner of holding a staff with one quarter of the stave between the hands, both hands nearer one tip, leaving three-quarters of the weapon pointing at the enemy like a lance. bands of men who looted and robbed at will when King Edward II left London. general purpose horse of a good size, used by men-at-arms for a warhorse, or a packhorse. workers who cleansed a town’s streets of faeces and rubbish. the official responsible for the law in the King’s forest. Keeper of the King’s Peace, known for his astute investigation of crimes. Baldwin’s servant and chief man-at-arms. Once a bailiff on Dartmoor, now a local farmer and freeman, Simon has been associated with the new government because of his hatred of the Despenser regime. friend to Simon and Baldwin, Coroner to the Hundred of Lifton. a knight loyal to the old King. vicar of St Peter’s, Willersey. daughter to Ham and Agatha. family of Florentine bankers who helped fund the King of England, based in Florence, but with a house in London. the oldest of the brothers and head of the Bardi family in London. youngest brother of the family. two merchants from the House of Bardi. bodyguard; supporter of Edward II. once King Edward II of England, he has been forced to abdicate the realm and pass it on to his son. a man-at-arms from the Despenser estates. John’s best friend; also a Despenser vassal. one of the men-at-arms who had been besieged at Caerphilly. another member of the Caerphilly garrison. an instigator of the plots to rescue the former King. brother of Stephen, and a Dominican Friar, Thomas had been a confidential agent for King Edward II and remained intensely loyal to him. a monk at the Augustinian Priory of Llantony-next-Gloucester. ally to the Dunheveds and involved in their plots. a Scottish earl who was intensely loyal to Sir Edward of Caernarfon and involved in many plots to release him. the young son of Edward of Caernarfon, he rules only with the approval and consent of Sir Roger Mortimer, his Regent. Also known as the Duke of Aquitaine. for many years Sir Roger was King Edward II’s favourite general, but now he is Edward of Caernarfon’s most hated enemy. one of the most powerful noblemen in England, who inherited his title when his brother Thomas was executed by Edward II for rebellion. a knight in the service of Henry, Earl of Lancaster at Kenilworth. son-in-law to Sir Roger Mortimer. a close friend to Lord Thomas. chief guard of Edward of Caernarfon. porter at the gate of Kenilworth Castle.